Dr. Gibson is a graduate of the University of Washington where she received a BS in oceanography and she received the PhD from the University of Georgia in Marine Sciences. She has served as the advisor for the Marine and Environmental Science Club, director of the DREAMS program, Co-Director of the Hall Bonner program, faculty mentor for the ASLOMP and MSPHD programs and acts as a conduit for scholarship and fellowship. 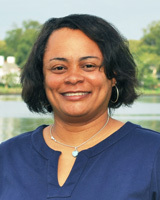 Her current activities include communicating ocean sciences to informal audiences (COSIA), ocean science education (COSEE) and research involving zooplankton dynamics and feeding behaviors.